Calgary, AB, Canada – September 14, 2014 – The Spruce Meadows ‘Masters’ Tournament CSIO 5* came to a thrilling conclusion today with the biggest show jumping event in the world, the $1.5 Million CP International, presented by Rolex. 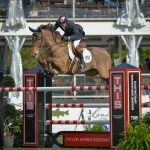 Canadian show jumping legend Ian Millar and Dixson, owned by Susan and Ariel Grange, triumphed through two rounds and a jump-off of challenging equestrian sport over 20-year-old Reed Kessler (USA) and Cylana. 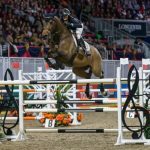 Today’s event was the second leg of the Rolex Grand Slam of Show Jumping, and Ian Millar is next in line to try and take equestrian sport’s most sought-after title. Watch a video of highlights from Sunday’s ‘Masters’ competition! 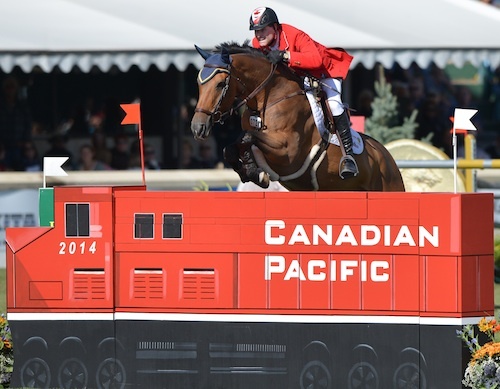 More than 89,000 spectators were on hand at Spruce Meadows today to watch one of Canada’s most acclaimed athletes win for the third time on Sunday at the ‘Masters’. Millar, whose incredible career has spanned decades, won previous editions of this event in 1987 and 1991 with his famous mount Big Ben. In Round One, there were 10 clear rounds. Twelve returned for the second round, along with Kevin Staut (FRA) on Estoy Aqui de Muze (who had four faults in Round One) and Robert Whitaker (GBR) with Catwalk IV, who had one time fault. Staut and Whitaker had eight and 13 faults, respectively, in Round Two for ninth and 12th places. Jerome Hurel (FRA) and Quartz Rouge had a rail and a time fault in Round Two to finish on five faults for sixth place. 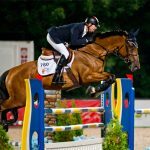 Alain Jufer (SUI) and Wiveau M tallied 13 faults for 11th place, and fellow Swiss rider Steve Guerdat on Nasa had nine faults for eighth place. Kessler and Cylana were next in, and they recorded a brilliant second clear round. With a fist pump after going through the timers, Kessler would have to wait and see if anyone else could match her performance and take it to a jump-off. Two trips later, that’s just what would happen when Millar and Dixson galloped clear through the timers to the roar of the crowd. In between Kessler and Millar, Marie Etter completed the course with four faults on Admirable for third place, ending a strong day for the Swiss team. 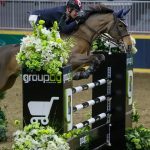 Olivier Philippaerts (BEL) and Cabrio van de Heffinck were close to repeating their 2012 victory, but one rail and a time fault left them in fifth place. 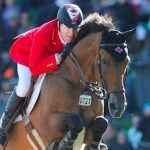 Eric Lamaze (CAN) and Zigali P S had nine faults, and Shane Breen (IRL) on Golden Hawk tallied 13 faults, which placed them seventh and 10th respectively. Last in the ring, the crowd held their breath to see if it would be a three-way jump-off. It was not to be as one of the favorites, Beezie Madden (USA) and Simon, had one rail down and a time fault. They ended up in fourth place. First in for the jump-off was Kessler on Cylana, a 12-year-old Belgian Warmblood mare by Skippy II x Darco owned by Kessler Show Stables. Kessler was fast and efficient, and Cylana made easy work of the jump-off course, finishing clear in 49.50 seconds. Millar had the advantage of seeing Kessler go. He and Dixson, an 11-year-old Belgian Warmblood gelding by Vigo D’Arsouilles x Olisco, made tighter turns and put the gas pedal down across the big grass field of the International Ring. When the timers stopped on a winning time of 47.33 seconds, the spectators gave a standing ovation to Millar. Ian Millar acknowledges the huge crowd of spectators at Spruce Meadows. For Marie Etter, the experience of competing at Spruce Meadows ‘Masters’ and finishing in third place is more than just a good result. The pair have been together for seven years; Etter found the now 14-year-old Hanoverian gelding by A Jungle Prince x Rhytmo competing in small national classes in Germany. “I fell in love when I saw his face, the eyes,” she said. They worked up to the international level together, and Etter’s husband took over the ride when she was pregnant. Etter and Admirable teamed up again, but he ended up having two colic surgeries. “He was dying. He spent two months in the clinic. We did everything for him. My groom did a really good job, he was there everyday. We had a good relationship before, but after that, the connection is just amazing. I’m happy to be third, but I’m really happy how he fought for me. We do this because we love horses. When you feel your horse fighting for you and giving everything for you, that’s the best feeling,” she related. Etter said it was a dream to be at Spruce Meadows ‘Masters’, having watched the grand prix every year on television before. “I’m not used to jumping at this level. Calgary is really special. I was feeling a bit small the first day. Ok, I am small, but I was feeling really small! Today I’m feeling a little bit less small!” she said with a smile. 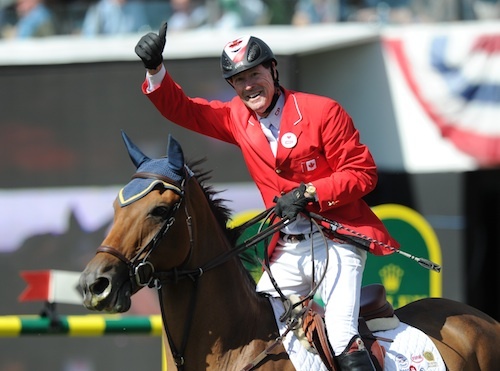 With his victory today, Millar is in the running for the Rolex Grand Slam of Show Jumping. The next leg is at CHI Geneva in December. While Millar originally hadn’t planned to show in Geneva, he said he would discuss with Dixson’s owners about taking the trip to Europe this winter. “Circumstances change plans. I think it would be a lovely idea to go to Geneva in December,” he remarked. 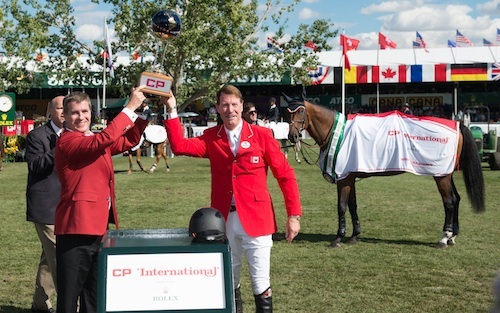 Ian Millar raises his winning trophy with Keith Creel, President & Chief Operating Officer, CP.